Press Release by Eastman Credit Union – Friends and Neighbors, Inc.
KINGSPORT – A leap of faith for one man has led to answered prayers for ten local families, who now have homes. Through private donations and partners like Eastman Credit Union, he is hopeful that even more Kingsport homeless will soon live independently, too. “It’s safe to say that much of our community probably isn’t aware of the serious problem we have with homelessness in Kingsport. Currently, we have more than 200 students in Kingsport City schools without homes. Our organization focuses on helping Kingsport families with school aged children. Our families can afford small rent payments, but don’t have enough to make it on their own, just yet,” said Kermit Addington, founder of Friends and Neighbors, Inc. The number of homeless children in city schools has been increasing steadily over the last five years, and Kingsport has little to no entry point for these families to get back into their own safe, stable home. That is why Eastman Credit Union has stepped forward along with some individual contributors to partner with Friends and Neighbors, Inc.
“What this organization does is extraordinary. At ECU, we strive every day to be a good neighbor. When we heard about Friends and Neighbors and saw the passion of its founders and the results of their hard work, we realized that although they are a newly formed organization, they are focused on making a difference. We hope that through our donation several local families will get homes,” said Olan O. Jones, president and CEO of Eastman Credit Union. “We’ve done pretty much everything on faith…an angel bought our first house and our first family moved in that house on October 15th,” said Addington, as he shared the story of the generosity that surrounded the beginnings of this newly formed organization. 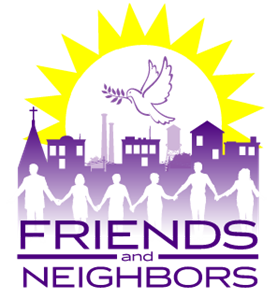 Friends and Neighbors is off to a great start, but they are seeking additional support. “We’re taking it one step at a time. I didn’t have a clue how these homes would be paid for when we started, but I knew they were going to be. These children deserve homes and thanks to Eastman Credit Union and generous private donations, we have been very successful since our first family was placed a few months ago,” said Addington. Friends and Neighbors, Inc. has learned a lot about what works when combating homelessness, but they simply need more funding to invest in solutions to help transition more families from homelessness to independent living. Volunteers lead the organization, so all proceeds from community contributions go directly to fulfilling the organization’s mission. If you would like to assist Friends and Neighbors, Inc. contact them at 423-967-2278. Donations no matter the amount are needed and appreciated.